peek >> << backThe Yards Park footprint, April 2004. 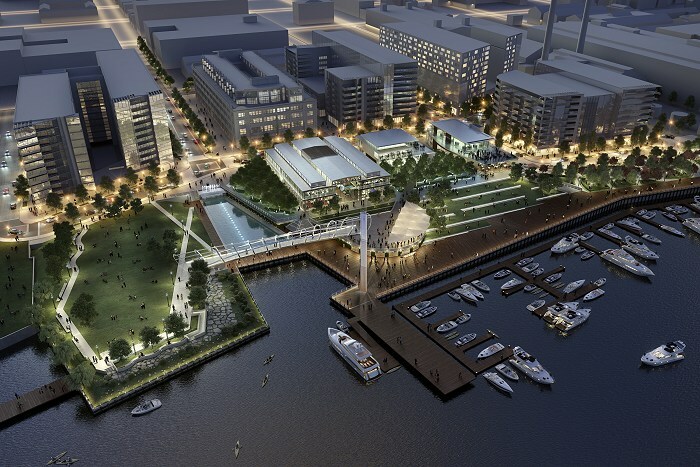 A pre-construction rendering showing an aerial view of the Yards Park at dusk. The "Great Lawn" is the green patch at left, the expanded Canal Basin with its pedestrian bridge is just to the right, the Lumber Shed and its plaza is at top center, and the boardwalk runs across the bottom past marinas and piers and west to Diamond Teague Park. The park officially opened on Sept. 7, 2010. Sept. 7, 2010 - The Pedestrian Bridge and Light Tower, seen at the park's Sept. 7 grand opening. For many more photos from the ribbon cutting, see this Gallery. Sept. 7, 2010 - What the park's waterfront looked like on its opening day in 2010, back when the Display Ship Barry was still docked up river. Oct. 22, 2017 - And sort of the same angle, with the Barry gone but with the park's new marina open and the boarddwalk kiosks at last occupied and opened. 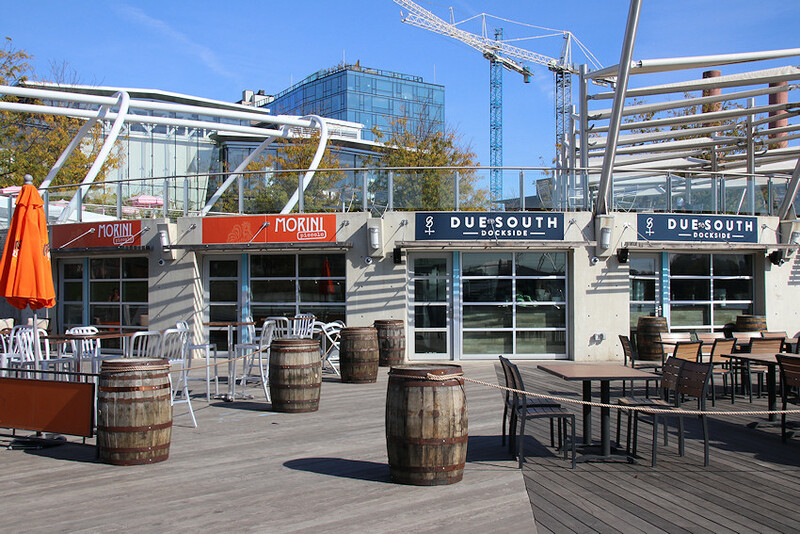 Oct. 22, 2017 - A close-up of Morini Piccolo and Due South Dockside, soon after their debuts. 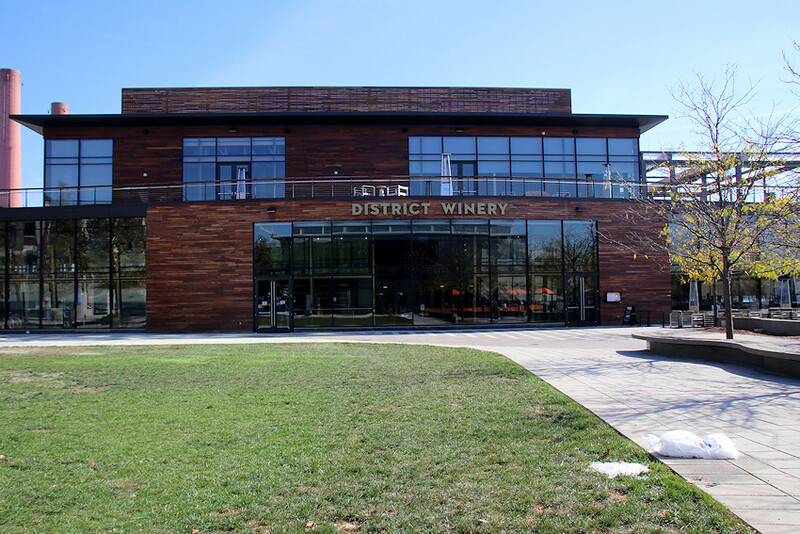 Oct. 22, 2017 - And the District Winery building, not long after it opened in late summer 2017. March 7, 2016 - An on-high view of the central area of the Park, seen from Arris, while the marina was still under construction and before District Winery occupied the lower left grassy lot. A before-and-after-and-after of the park as seen from Poplar Point, looking north up Third Street, SE, first on March 3, 2005 (top), then and Jan. 8, 2012 (middle), then on Feb. 27, 2016 (bottom ). The large bunnies were a temporary art exhibit, not an invasion. Note the changes to the building housing the Foundry Lofts and the Lumber Shed, along with the arrival of the Arris apartment building. Not to mention the appearance of the US Department of Transportation HQ. Sept. 24, 2010 - A nighttime shot at the park, showing the canal basin, the Lumber Shed, and the ghostly presence of the Foundry Lofts building. For more nighttime shots of the park, see this gallery. Sept. 7, 2010 - Standing on the Great Lawn the day of the park's opening, looking back toward the Canal Basin and the Foundry Lofts. Sept. 29, 2018 - And a tighter view of the same spot eight years later, showing the completed work on the Foundry Lofts and the construction on "The Estate." 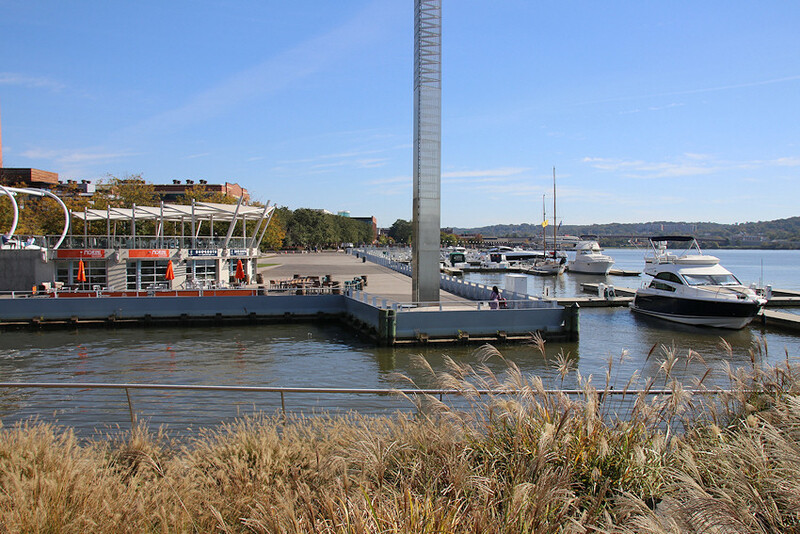 Sept. 29, 2018 - And the same view more than six years later, with the new DC Water headquarters and the Dock 79 apartment building changing the horizon. Aug. 6, 2005 - A "before" view of the park's footprint along 3rd Street south of Water, in August 2005. Mar 17, 2019 - The same location, now known as the Third Street Plaza. For many more before-and-afters in the park, see the Expanded Archive. Aug. 6, 2005 - Turning around and looking north up Third Street from south of what would become Water Street, in 2005. Mar 17, 2019 - The same location, showing off the canal basin, the waterfall, and the fountains at the Third Street Plaza. July 17, 2008 - The riverfront near the bulkhead, before. Sept. 7, 2010 - A similar view of the same location, with the park completed. July 17, 2008 - The historic Lumber Storage Shed, built in the 1930s and showcasing its decidely non-historic salmon-colored tin exterior. June 9, 2016 - A slightly shifted angle of the same location, not quite six years later, with the Foundry Lofts' renovation long since complete and Arris now finished next door.